Heavy snow, total accumulations of 5 to 7 inches possible. * WHAT...Heavy snow possible. Total snow accumulations of 4 to 6 inches possible. * WHERE...Portions of south central Minnesota. * WHEN...From late Tuesday night through Wednesday afternoon. * ADDITIONAL DETAILS...Plan on slippery road conditions. The hazardous conditions could impact the morning commute. * WHAT...Heavy snow, total accumulations of 5 to 7 inches possible. * WHERE...Much of Iowa, including north central areas of the state. * ADDITIONAL DETAILS...Travel could be very difficult. Winds will remain fairly light, but intense snowfall rates may result in considerable visibility restrictions, with road conditions deteriorating rapidly Tuesday night. Hazardous travel conditions could impact the Wednesday morning commute. * WHAT...Heavy snow possible. Accumulations of 4 to 6 inches possible. 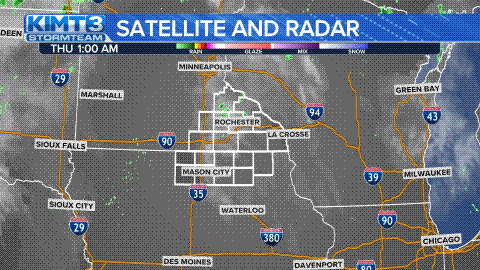 * WHERE...Portions of west central Wisconsin, northeast Iowa and southeast Minnesota. * ADDITIONAL DETAILS...Plan on slippery road conditions. The hazardous conditions could impact the Wednesday morning commute.